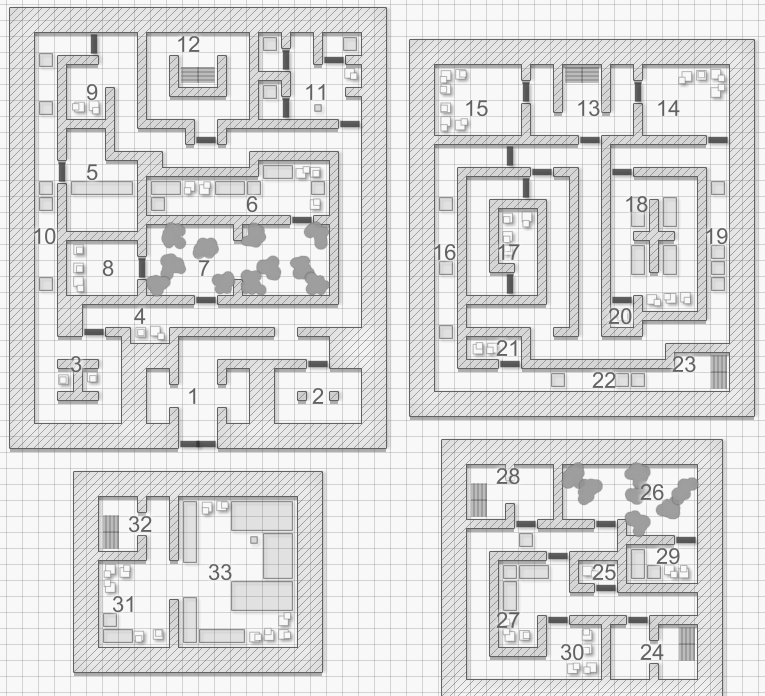 Long ago, the Fraternal Order of Cinnabar sent one of their scholars, Frabdan Wald, to investigate the crumbling ruins of the Temple of Mukram in the city of Viskan. He returned with most of his men dead, driven insane by the secrets he had seen. Now he crouches in a tower in the Trackless Forest, working to unlock dangerous secrets from unknown artifacts. He must be stopped before he unleashes catastrophe on the Five Free Cities. And you’re the only adventurers at hand. Note: I’ve never gotten a chance to run this adventure yet, but compared to the Ruined City of Viskan, it should be a bit of a cake walk. Hopefully a fun one, though. When Frabdan Wald returned from the ruined city of Viskan, he was a changed man. He was wracked with guilt over the loss of Thymoole Kars, and that the entire expedition was a waste, the terror and pain and planning going for naught. He became obsessed with the myths of the Moongraal, to an extent that Magister Nurreold felt was unhealthy. After the two had an immense falling-out, Wald departed Gwaethyr for the Trackless Forest, to find the lost Tower of Rethrian. He found it, but never returned with news; instead, he made the tower his new home, and went to work analyzing all of the Viskani artifacts he’d taken from Viskan, or stolen from the Fraternal Order of Cinnabar. He’s been at the Rethrian Tower for two years, and Magister Nurreold is worried about what Frabdan might do … and what he might have learned. The tower was originally commissioned by the Viskani Ur-Baron Galtras of House Rethrian. He found that the diversions of the city tempted his sons and other apprentices of his House away from their magic studies, and he wanted a safe place for them to study, (relatively) free from distraction. Rethrian was a minor house, known primarily for farming Sunset Petals on with the Spicewind Isles, and so a small tower was sufficient for raising their apprentices. The tower is three stories high, and was originally surrounded by a short wall, patrolled by soldiers, and protected by magical beasts. The tower today stands alone, with just a moss-covered stone courtyard marking the inside of the wall. When Viskan fell, the elves of Ravensvale took it on themselves to wipe out the Tower of Rethrian. The tower was swarmed by fae forest guardians and battered by tree-people. Even a powerful wizard can’t run a tower by himself; he needs someone to cook, and clean, and empty the chamberpots. Inside, he found several Golem Servants, and a half-rotten Viskani manual on their creation and control. He found that anyone tattooed with the symbol of the House of Rethrian on their forehead could command the golems, and the golems could be programmed to obey anyone with the house emblem on any other part of their body. When goblins of the Irontooth tribe began to threaten the tower, Frabdan did the clever thing; he infiltrated their village at night, and after wrecking the place up, he offered the creatures the chance to serve him. They eagerly agreed. Wald branded the lesser goblins on their palms, and instructed them that holding their hands up to the golems signifies peaceful intent. On Thressa as on many worlds, goblins are mean, nasty, small, and primitive creatures about as intelligent as a 3- to 5-year-old. They are messy, violent, loud, and have short attention spans, so they’re not at all the ideal servants, but Wald is so distracted by his work that he only notices their most egregious failures. At least goblins are a “superstitious, cowardly lot”, and Wald is able to intimidate them to obey, most of the time. Frabdan’s other servants are a pair of teenagers from Bhairsin, twins who ran away from home to escape their drunk and violent father. They petitioned Wald for weeks, until he finally agreed to take them in as his apprentices. Vallian and Villiana have learned to read Wald’s moods well enough, and find that although the old mage is obsessive, he’s rarely cruel to those who aid his aims, and they have both managed to pick up a smattering of magic charms in their time there. They’re the only ones who know what the brands really are and what they’re for; both are tattooed on their chests, just between and below the collarbone. As Frabdan investigates the Viskani artifacts, he’s become more and more concerned about outside interference. In addition, the goblins are hard to manage, and his apprentices were not really up to the task. 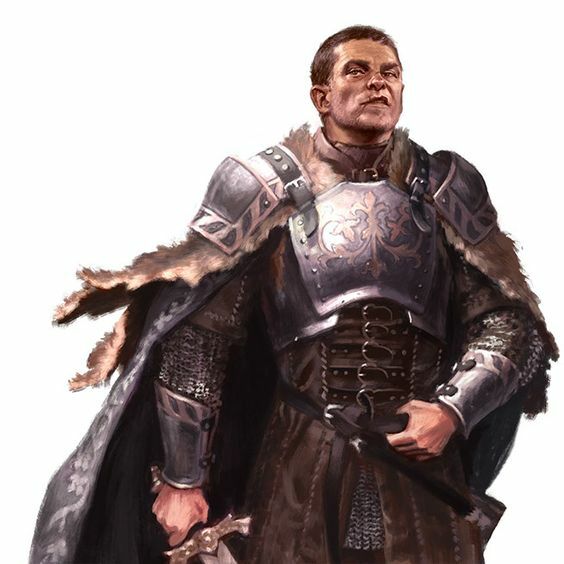 He recently hired mercenary Jaddarus Skorth from the Company of the Clawed Gauntlet to manage his security arrangements. He keeps Skorth well-fed and entertained, and Skorth finds this an easy assignment, and enjoys browbeating the goblins and occasionally tormenting the apprentices, so it’s working okay so far. So to recap, the servant golems have several commands programmed into them, keyed to seeing the symbol of House Rethrian. Scarred Symbol of Rethrian on Palms (Goblins, Skorth): The servant golems will let the subject come and go as they will. Tattooed Symbol of Rethrian on Chest (Apprentices): The servant golems will execute temporary deviations from their ordinary behaviors, for no more than 1 hour. Tattooed Symbol of Rethrian on Face (Frabdan Wald): The servant golems will obey the individual without question, including changing their programming. Faking the Symbol of Rethrian: The symbol of Rethrian is a complicated and difficult round grid-like design, and it takes a difficult manual dexterity roll to draw it properly. Most of the furnishings in the tower are ancient, dating from the time of the Viskani, or recently brought by Vallian and Viliana. Older pieces of furniture here, including doors, are pretty brittle. Adventurers can smash these things with little difficulty. Newer things are in much better condition. Room 1: The Grand Entryway. To the left and right of the door inside, are small alcoves. Danger: One golem servant waits here, screening those who enter and leave. Anyone without the Symbol of Rethrian will be attacked. #Appearing: 1, COM: +3, HD: 6 [WND 27], DEF: 12, PRO: 8, DMG: 4d6+4 (stony fists), Save 8+, MOV: Walk 5m, Morale: 1+. Slow: Golem Servants only take one Major Action every 2 rounds. Solid Construction: Golem Servants take half damage from blunt attacks, and only 1 point per die from edged attacks. Unliving Immunity: Necroids are unliving machines, immune to disease, and poison. Mindless Immunity: Necroids are immune to mental effects, such as the Psi Jolt Esper Talent or the Implant Suggestion spell. They never fail Morale saves. Unliving Immunity: Golem Servants are unliving constructs, immune to disease, and poison. Description: When you need a maid, a butler, and a cook, but most of all an indestructible bodyguard, what do you do if you’re an evil sorcerer? Well, if you are running low on slaves, you construct a being whose only purpose is toil, with a little murder on the side. Loot: The goblins often leave their stone spears and knives here, and there are always 1d6 of these inferior weapons here at any time. Nothing special here, just a few cloaks belonging to Skorth or the apprentices. The goblins have been ordered to leave this room alone on pain of death, and the servant golems check on the room from time to time to make sure. Originally, this room held pigeons for communication with Viskan. Now, in a fit of whimsy and weird pique, Wald coaxed a Bladebird to sit here and guard. Danger: One Bladebird perches here, trained to stay by regular enticements of blood and red meat. It will attack anyone with open wounds or covered in blood that happens by. #Appearing: 1, COM: +2, HD: 2 [WND 9], DEF: 12, PRO: 3, DMG: 3d6+1 (bladed wings), Save 10+, MOV: Walk 5m, Flight 30m Morale: 1+. Cry of Carnage: Anyone that can hear a Blade Bird must make a Mental Save or be overcome with bloodlust. They gain +2 to all attacks, but lose 1d3 WND each round they fail to shed blood, or if they attack the Blade Bird itself. Mindless Immunity: Blade Birds are immune to mental effects, such as the Psi Jolt Esper Talent or the Implant Suggestion spell. They never fail Morale saves. Unliving Immunity: Blade Birds are unliving constructs, immune to disease, and poison. 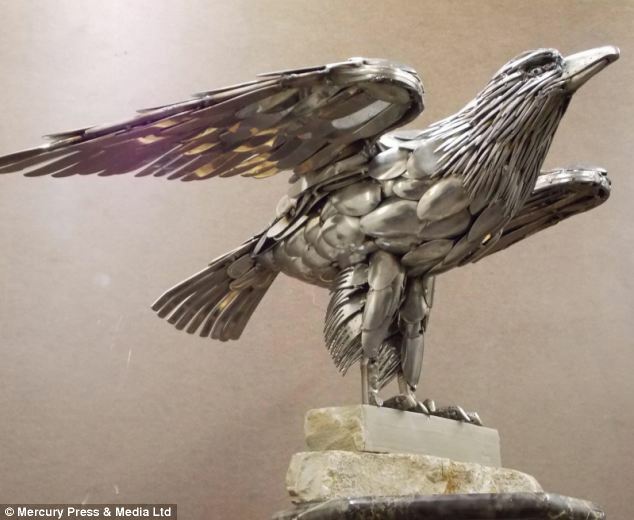 Description: Golems made from knives and swords, Blade Birds feast at a battlefield, “consuming” shattered blades and chunks of armor, becoming larger until they finally split into a smaller Blade Bird. Blade Birds are relatively intelligent, and they will ally with anyone powerful whose hearts turn easily to war, encouraging them in a variety of subtle ways to make battle against their neighbors, so the Blade Birds can feed. Loot: The birdcages laying about are mostly metal (and smashed), but a few are made of copper wire. The copper could be melted down and sold for 6d6 copper pieces. In addition, a couple of goblin skeletons here have some rings and necklaces and other trinkets worth about 3d6 silver. A few pounds of soap, that’s all. 1d3+1 blocks of soap, wrapped in paper, weighing 1/2 lb. each and worth about 1 silver each. One is half-eaten, and has the marks of goblin teeth. The servants and locals once came here, and the Viskani rendered judgment on them by seeing if they could survive some horrid torment. Danger: The door locks behind the characters, and the room fills with bees. A slot in the floor opens, but it’s filled with leeches. Anyone that stays above suffers 1 point of damage per round for 2d6 rounds, while anyone that dives in the water suffers -1 to all stats until the leeches are removed. Removing the leeches without great care can cause the wounds to become infected; the character must make a Physical save or suffer a -2 penalty to all actions for 1d3 days. On a critical failure, they also suffer 1d6 damage each day, also. The door opens after 10 rounds. Loot: The several corpses here have 1d3 gold, 2d6 silver, and 6d6 copper. Room 6: The Goblins’ Quarters. A large clutch of goblins lives in putrid squalor here, when they’re not out wandering or doing tasks for Frabdan Wald. Danger: 1d6+1 goblins can be found here at any time, gaming, sleeping, fighting, or (worst of all) making baby goblins, a process that even the most curious of voyeurs may find disturbing. Loot: The goblins have all kinds of junk, but that’s pretty much all it is. It will take an hour of searching to find about 2d6 copper and a large handful of broken pottery, bones and teeth, wicker baskets, random bits of paper, and a few daggers and knives. #Appearing: 2d3, COM: +2, HD: 1 [WND 5], DEF: 12, PRO: 1, DMG: 1d6+1 (dagger), Save 10+, MOV: Walk 12m, Morale: 9+. Description: Goblins are small, screeching nuisances, but with ample bribes, punishment, and patience some manage to recruit them as minions. Goblins are a lot more intelligent than they first seem, but their vicious, crude humor and their insatiable curiosity always gets them into trouble. Mirrored tubes pipe in sunlight from outside. Here, a variety of vegetables grow for the inhabitants to grow. Most of the hebs here are for cooking, but some are useful spell components. Danger: The Servant Golem in Room 8 is here pretty frequently. Loot: Food. Lettuce, mushrooms, tomatoes, and other vegetables. A large firepit dominates the center of this room, where a small boar is slowly being roasted. A long table to the north is covered with vegetables and herbs, and storage cupboards cover the west end of the room. A single human-sized golem putters around in here, making dinner, although it steps out from time to time to reset the traps from time to time. A small pot and winch allows water to be heated at the kitchen fires and then lifted up through the ceiling into the bathing chamber in Room 17. 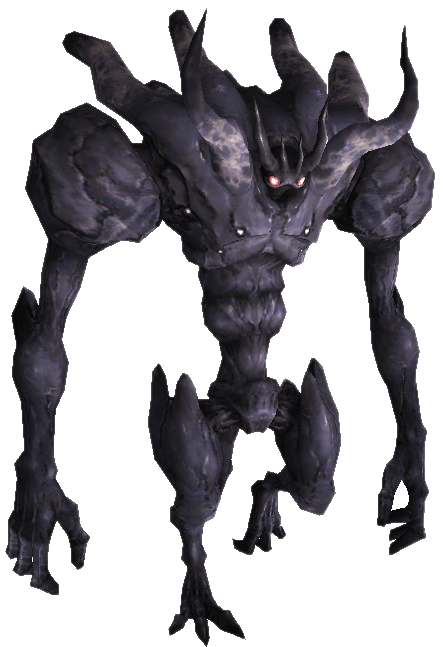 Image credit: Golem from Final Fantasy XI. Danger: This area is manned by a Golem Servant. It’s smart enough to read a recipe, and dumb enough to follow it precisely, with no variations. Clever adventurers might change the Golem’s recipe to send it off into the woods to find some impossible ingredient. Room 9: The Writing Desk. One ink-covered goblin sits here, chewing on the expensive writing quills, drawing stupid stick creatures. Ink splatters the walls and floor, and the goblin gibbers to itself, having a grand time. Danger: Just the one, distracted goblin. Loot: Three drawing kits here, that haven’t been ruined. In addition, one of the apprentices accidentally left a magic scroll here, that has 1d3 spells, each of Level 1d3-1 (minimum 1). Room 10: The Burning Corridor. Flashbacks to sitting in front of a campfire, of seeing a house aflame … but only for a moment. Everything is normal. Just a regular old hallway. Danger: A weird enchantment on this corridor opens a time ripple, gating the adventurer temporarily to the burning of the ancient Viskani city of Shattarath. Whoever’s in front at each of the three spots must make a Save roll vs. spells. If they succeed, they suffer no damage. If they fail, the character disappears for a moment, and then reappears on fire, taking 1 point of damage per round for for 1d3+1 rounds. Top Left Room: One of the goblins that was caught stealing from the kitchens. Top Right Room: A Rodement that Frabdan has been experimenting on. It is very sick, and most of its fur has fallen out. Bottom Left Room: A hostage from the Seal of Red and Black, Demojan Linvarne. Danger: None, other than the prisoners. #Appearing: Unique, COM: +4, HD: 4 [WND 18], DEF: 13, PRO: 0, DMG: 1d3+2 (expert unarmed strike), Save 11+, MOV: Walk 10m, Morale: 8+. Demojan Linvarne has all the Skills and Talents of a 4th-Level Thief, including the Backstab*3 Talent. Description: Demojan Linvarne is a former lover of Tethamere, leader of the Seal of Red and Black. She is deluded enough to think that Tethamere ever cared about her. She knows that he is half-Viskani, and about the shadow war with the Ratwalkers. She was sent to Frabdan Wald to negotiate an alliance, and she’ll do anything to accomplish her mission or, barring that, escape safely. Room 12 and 13: Stairs. Nothing to see here. The stairs in Room 12 go up to the 2nd floor, while the stairs in 13 go down to the 1st floor. Nothing special here, just pots and pans and some jerked meat and canned fruits and vegetables. This room contains all the parts needed to construct Servant Golems. Fortunately, Wald doesn’t have the rare materials to build more golems, and won’t spend the time to gather them. Is that a … slightly chilly breeze? Nah. Danger: This area is patrolled by invisible, intangible ice spirits. Whoever’s in front at each of the locations is instantly frozen in a block of ice, unless they can make an Avoidance save to escape. A frozen character suffers 1 point of damage per round, until they fall into a coma. An ice block is tough to break open, and it’s very tough for a frozen character to break themselves out because of their lack of leverage, a Challenging (18+) Might roll. A clawfoot bathtub dominates this room, along with several cotton towels, and a fuzzy pink bathing gown. A bucket can be lowered through a hole in the floor by winch to the kitchen in Room 8, where the water can be heated. This is where Vallian and Villiana sleep. There are two additional beds here, that typically go unused. Loot: Two identical spellbooks here, with a few low- to moderate-level spells, common to all sorcerers in their first years of study. The margins are covered with scrawled, amateurish notes and idle doodles. #Appearing: 2, COM: +0, HD: 1 [WND 4], DEF: 0, PRO: 0, DMG: 1d6+1 (dagger), Save 11+, MOV: Walk 10m, Morale: 9+. Cast spells as a Level 1 Arcanist with LOG 14 (LOGm+1). The character knows the Cantrips spell, and 1d3+1 other random 1st-Level Formulae. Description: Every successful, settled sorcerer has a few apprentices. Most of the time, they do scutwork around the lab, cleaning alchemical glassware and transcribing scrolls. Every once in awhile, they get into something they shouldn’t, earning stern reprimands (and sometimes painful and embarrassing curses). Room 19: The Corridor of Falling Blocks. A nice, safe, empty corridor. A corridor that is nice and safe. Danger: Nearly invisible, weighted wires hang from the ceiling. Anything that disturbs the wires triggers the traps. Whoever’s in front at each of the three spots gets clobbered by rocks falling from above, unless they’re observant and quick, suffering damage as from a giant’s club. A closet where the apprentices go to eliminate bodily wastes. Nothing special here, just a chamberpot and a perfectly normal unpleasant odor. The goblins are not allowed in the privy. No one will tell the story of the trouble that caused this prohibition, but Vallian and Villiana still have nightmares of cleaning up afterward. 1d6 blocks of soap, wrapped in paper, weighing 1/2 lb. each and worth about 1 silver each. Danger: As the adventurers troop along through this corridor, suddenly runes on either side activate. Invisible runes on either side relay a constant beam between them, and anything that interrupts the beam is struck by blades of invisible, elemental air. Whoever’s in front at each of the three spots has a chance to leap to safety, otherwise they’re sliced up as by 2 to 3 knives. They must make an Avoidance save, or suffer 3d6 damage. Take you up or down. The stairs in Room 23 leads down to the 2nd floor, while 24 leads up to the 4th floor. As with the herb garden on the first floor, periscope-like ports on the side of the tower bring in sunlight to grow these plants. Danger: The garden is tended by a Servant Golem. This golem steps away from time to time to reset the traps on this level, and to check on the spell components in Room 30. Loot: A large number of Cleft-Hoof Leaf plants, including several from Frabdan Wald’s “special reserve” breed. The goblins are technically forbidden from coming here, but they frequently do anyway. Danger: There are 1d3+1 goblins here. All of them have been smoking the “special reserve” pipeweed and are high as a kite. The intense pipeweed smoke causes everyone in the room to choke and their eyes to water, even if they’re not smoking out. Loot: Frabdan Wald’s “special reserve” pipeweed is a special breed of Cleft-Hoof Leaf, much more potent than the run-of-the-mill breed. Smokers, and those nearby, will experience mild hallucinations and an intense, pleasant buzz for a few minutes, and a general listlessness and mild hunger. In game terms, they regain 1 point of lost FOC, but suffer -1 to all rolls for 2d6 *5 minutes. There are 2 doses of “special reserve” here. Once, Ur-Baron Rethrian’s gardeners kept this room, so they could water the rare plants in the adjoining room night and day. Now, the room has been claimed by Jaddarus Skorth. Danger: If the adventurers arrive at night, there’s an 1 to 4 on 1d6 chance that Skorth is here. Early in the evening, he’s probably drunk, and so suffers a mild penalty to all rolls. He likes to patrol the grounds from time to time, even at night, though. Jaddarus Skorth is a 3rd-Level Fighter, with +2 modifier from Strength and 18 HP. He’s armed with a longsword, and usually wears hide armor. #Appearing: Unique, COM: +5, HD: 5 [WND 23], DEF: 12, PRO: 4, DMG: 3d6+3 (Long Sword), Save 11+, MOV: Walk 10m, Morale: 12+. Description: Jaddarus Skorth is a cruel, stinking drunkard, an inveterate braggart, but on the bright side, he’s not particularly bright or ambitious. Permanently hired from the Company of the Clawed Gauntet by Frabdan Wald, he’s happy enough as long as he has enough wine, and occasionally can visit Gwaethyr on an obscene spree. Loot: 2d6 bottles of cheap ale, of which 1d3 are half-finished, 1d6 gold pieces, 3d6 silver, and 4d6*10 copper, a spare longsword, three daggers, and 4 other random pieces of equipment. A large wooden cabinet here. Danger: The Servant Golem from the Pipeweed Garden stops by frequently to check on things here. Loot: One of each of the following, and 3 more random. Characters with the Alchemy proficiency may make an Intelligence throw to figure out what each component does without consuming them. These spell components only affect arcane spells and rituals, not godly miracles. “Benefits” can include a bonus to spellcasting rolls, or a chance that a cast spell is not lost, or a boost in spell power to a successful casting. Spellcasting benefits mean that such spells cost 1 less FOC, to a minimum of 1. Spellcasting penalties means that related spells cost +1 FOC. Mild withdrawals usually result when the character can’t partake in a drug every day. They suffer -2 to all rolls for 1 week. Diamond Oil: Causes a penalty to call on gods and spirits, but a bonus to cast mind-related spells; lasts 4d6 minutes. Dried Mooncap Fungi: Character gains Extra Sense [Infravision] Talent for 1 hour, if they don’t already have it. In addition, benefits spellcasting rolls by Elves and elf-related spells, for that duration (7 gp). Mildly addictive for Elves (must make a Physical save to avoid). Sunset Petals: A powerful analgesic and opiate, Sunset Petals allow the imbiber to ignore any penalty from wounds or pain for one hour, potentially gaining 1d3 temporary WND. Subjects must make a Physical save if they take Sunset Petals multiple times, or suffer mild withdrawals. A huge, triple-wide bed, with satin sheets and several quilts, rumpled and unmade. Danger: At night, there’s a 1 to 2 on 1d6 chance that Wald is here, asleep. If he’s not, he’s in the adjacent laboratory, working feverishly on some weird project. Loot: 6d6 gold pieces, 4d6 gold pieces, 2d66 copper pieces. Satin sheets worth 5 gold, 1d6 maps and books worth 2d6 gold each, and a jade figurine from Tesh Para worth 30 silver. These are stairs. They go down. A large open door opens onto a work room, filled with bubbling beakers and scribbled notes. Three large work tables form a “U” in the northwest corner of the room. The southeast side has a trunk, presumably full of alchemical reagents. The southwest and northwest corners have large bookshelves filled with arcane texts. Danger: Frabdan Wald is (most likely) waiting here. If there is even the slightest credible warning, Frabdan will activate the spell spawn. Otherwise, he’s busy deciphering rubbings from a Viskani artifact. He can also grab throw bottles of boiling reagents off his work desk, and throw them for 1d6 damage. #Appearing: Unique, COM: +2, HD: 4 [WND 14], DEF: 11, PRO: 1, DMG: 1d3 (punch from a spindly old man), Save 9+, MOV: Walk 10m, Morale: 8+. 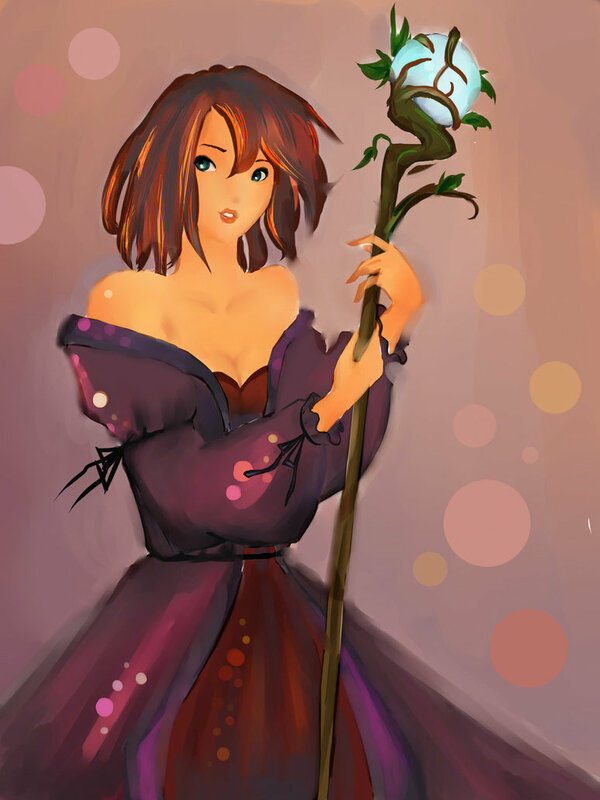 Description: Wald can cast spells as a 4th-Level Arcanist with a LOG 17 (LOGm+2). He can cast any spell from Levels 0 to 2. Wald possesses two magic artifacts called Sorcery Spawn, both with Magic Missile infused into them, and carries the Viskani magic dagger Drethram Tharthial. Because of his madness, Wald is paranoid and hyper-alert, and it will be difficult to sneak in or get the drop on him (-2 to Infiltrate rolls to approach undetected). Drethram Tharthial, or “Burning Scarlet River”, is a deadly assassin’s tool which continually leaks numbing poison. Iskanix was the Manticore God, patron of the Viskani Empire and lord of poison. The dagger has a +2 bonus, grants immunity to poison to its bearer, and it continually drips poison which makes the target shaky and clumsy. The target must make a Physical save or suffer -2 to all actions for one hour as their nerves and muscles betray them. The bearer is affected by the curse of Iskanix; as the god of conspiracies as well as poison, within 1d3 days of bearing the dagger continuously, the bearer begins to suspect everyone is plotting against them, causing nightmares and even brief hallucinations. A save vs. spells can fight off the dagger’s tricks, but only briefly. 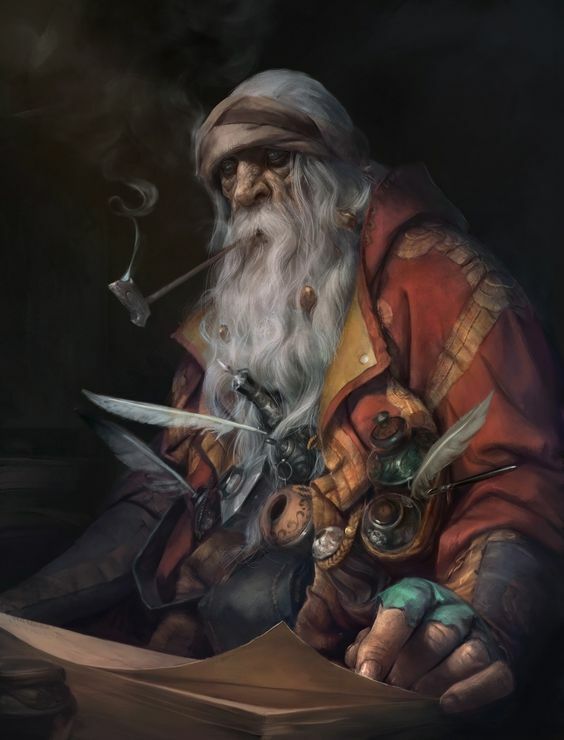 A smart and self-possessed person will lock the dagger away and only carry it for brief periods of extreme need, but most adventurers are not that insightful. Sorcery Spawn look like metal fish carved with runes, with emerald eyes, that swim through the air around an attuned caster. The Sorcery Spawn act as repositories for spells of up to 4th Level, which they can cast up to every (Spell Level) rounds on verbal command. This allows the user to double or even triple their attack power. However, each time the Sorcery Spawn is used, it has a (1 on 1d6) chance of shattering and inflicting 1d6+1 damage on the user. Frabdan Wald is not stupid, nor is he suicidal. He will run if the fight is going badly, and is willing to negotiate with the players. By negotiate, we mean, he will explain his viewpoint and goals, and try to get the adventurers on his side. He’s not going to give up his experiments with Viskani artifacts, but he will point out that he thinks it’s stupid and shortsighted to ignore the vast power of the Viskani, shut it away forever, like the Fraternal Order of Cinnabar wants to do. If the PCs do work with Wald, they will need to bring back proof of his death if they want to keep good relations with the Fraternal Order of Cinnabar. Wald will do anything reasonable; give them one of his robes and stain it with his blood, or one of his older, less-useful spellbooks. The PCs will have to deal with the fact that Wald is insane, though. He varies wildly between sluggish despair and manic energy. He often develops an obsession with some area of magical research. He insanely jealous of anyone he thinks might surpass him in the mystical arts (a problem for his apprentices, for sure). Wald has fits of paranoia, and is mildly afraid to leave the tower (hence the gardens inside for pipeweed and spell components). Finally, Wald has frequent nightmares about the trip to the city of Viskan, as well as nightmares about the terror – and glory – of the old Viskani Empire. Wald’s insanity comes 30% from the disastrous expedition, but about 70% from his proximity with Drethram Tharthial. If the dagger were somehow lost, he could regain most of his sanity in a month or two, but that’s pretty unlikely to happen. If they ally with him, though, canny heroes will note that Wald frequently toys with the dagger (20% chance at any time that he’s playing around with it), and always seems crazier when he does. The PCs can murder him during negotiations, but if they do, he gets a dying attack, levying a curse of blindness for several weeks against his attacker. Drethram Tharthial, the Dagger of Iskanix, and will use it in combat. He also has a Potion of Salutatory Revivification (typical healing potion). The bookshelves hold spellbooks a handful of higher-level spells. The spells are a mixture of scrying, combat, stealth, and wierd research spells that provide bonuses to lore-related skill rolls. The Moongraal (a legendary healing artifact, the Holy Grail of this setting) is probably in either the forgotten ruins of the “sixth” of the Five Free Cities (! ), Nylune, or the Moon Fever Marshes. The Viskani found a way to attain immortality without the massive blood sacrifice. The artifacts required are the Moongraal, the Dagger of Iskanix, and two other unknown items. Frabdan didn’t know what these items were, but mentions lots of indications that one might be in some kind of city deep in the Onyx Desert, a city that somehow changes location periodically. There are lots of random rumors about Viskani society, Viskani magic, and the like, but they’re mostly inaccurate. Saturday, March 11th, 2017 at 1:01 PM. Filed under Five Free Cities Setting, Old School Gaming, Wormholes & Waystations RPG.